Our maths programme helps children of all ages and ability levels to develop maths skills and a love of numbers. Our students are aged two to older children and each one is assessed at the beginning of their Kumon journey to ensure they work at just the right level. 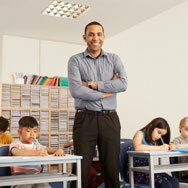 Study is set according to ability, regardless of age or school year, making it the obvious choice for any student wanting to progress or excel in maths. The programme goes right from the very basics of recognising numbers all the way to complex mathematical theories in small steps, building ability gradually along the way. We believe that every child has the potential to succeed in maths and our experienced Instructors support them to achieve this. Students acquire an ability to self-learn while developing understanding and fluency of each topic before moving on to another. Every student will begin at a comfortable level for them. Their individual starting point, along with their expected projection rate, is established at a free assessment. The Kumon Maths Programme not only helps young learners build solid foundations in numeracy but also helps them to develop the skills they need to learn with focus. Our Instructors encourage them in all aspects of study from the way they sit, place their hands, grip their pencil, approach their worksheets to how they maintain focus, working efficiently and building stamina. Early learners gradually increase the amount of work they complete each day, either at the study centre or at home, so that they maintain enthusiasm and are keen to learn using their Kumon worksheets. This gradual increase helps build concentration skills, starting with small steps and enticing them to focus a little longer each time. Studying with the Kumon Maths Programme engages young learners in fun activities that gradually build their understanding and confidence. We want each child's first experiences of dealing with numbers to be positive, exposing them gradually to worksheets that they can engage with and want to complete. We approach numbers by first learning how to count and read numbers, building up those great foundations for learning that your child can understand. The maths programme will be tailored to their ability with activities set at just the right level to enable them to succeed. This personalised and structured method of study allows them to focus on concepts until they have fully grasped them, building confidence in their own ability each day. The Kumon Maths Programme has been meticulously developed and refined over 60 years to enable children to build strong foundations in maths and give them the tools to excel. Early learners really benefit from starting the programme at a young age, ensuring that their understanding of number recognition, formation and concept is sound. Many of our young students will already be practising addition before starting school. Our students start as young as aged two, often amazing both Instructors and parents with their rate of progress and enthusiasm to learn. Our programme is designed not only to build a very positive study ethos from the start, but also to allow children to take on more advanced work for their age group according to ability. The Kumon Maths Programme allows each child to study at just the right level for them. We appreciate that children learn at different rates and their study programme must reflect this to help them to be successful learners and lay down strong learning foundations. Moving on to difficult concepts before more simplistic concepts are fully grasped can undermine learners' confidence and their ability to progress. Our Instructors assess students before they start their Kumon study programme to establish at which point they should begin. This approach means that we develop their study skills and build their confidence as they reinforce foundations and progress on to more advanced work. The Kumon Maths Programme aims to develop students' ease and enthusiasm for maths. Our expert Instructors enable students to learn through individualised study set at just the right level for them. Students will work through the different levels of the programme building ability and fluency in the different mathematical operations. New topic areas are introduced with introductory problems and examples and the difficulty levels are gradually increased in small steps. This approach allows each student to take ownership of their learning and really start to challenge themselves as their ability and self-belief grows. The Kumon Maths Programme allows children to work at their individual ability level without the restrictions of curriculum and age appropriate work. Children spend as much time on each level as they need to gain understanding and fluency in the topic being studied before moving up to the next level. This allows those who are ready for more challenging work to learn beyond school level and progress their abilities to an advanced level. Our maths programme aims to equip children with the tools to be able to do secondary school level maths with ease, tackling complex numerical concepts along the way and gradually leading up to and mastering calculus. Students will achieve this as we develop their ability to self-learn, working through worksheet examples and building problem solving skills. The Kumon Maths Programme helps build ability and fluency with mathematical operations whilst improving your child's study approach. 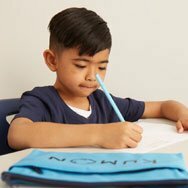 Setting aside some time each day for their Kumon study helps your child to get into positive learning habits, such as reading questions, instructions and examples thoroughly and to appreciate the progress they can make with dedication. Our programme is individualised and set at just the right level for your child enabling them to successfully progress in maths, improving confidence and concentration. The Kumon Maths Programme aims to enable students to complete secondary school level maths with ease. Students establish solid foundations in maths and then move on to master complex numerical concepts, culminating in calculus. Our programme is not tied to the curriculum and students move up the levels as their numerical fluency and ability allows, regardless of age. This gives students the opportunity to challenge themselves without restriction, working on mathematical problems beyond their school grade level. The Kumon Maths Programme not only sets out to give students the tools to solve complex mathematical problems, it also helps them to develop self-learning skills which will benefit them throughout their studies. As students progress through the higher levels of the Kumon Maths Programme, they will be increasingly encouraged to refer to examples and solutions to put in place the steps to solve the problem. Students who have completed all levels of the maths programme demonstrate significant expertise with numbers without reliance on a calculator, as well as the skills to master a new topic all by themselves, setting them up well for university study and beyond. Levels 6A to 4A aim for students to be able to recite numbers and count whilst pointing to the written numbers. At this level our worksheets make strong use of images, dot pictures and number tables to enable early learners to recognise, recite, read and understand number sequence, gradually increasing exposure to a larger range of numbers as they become ready. They first focus on numbers 1-5, then 1-10, 11-20 and so on, all the way up to 100, as well as writing numbers independently up to 50. Levels 3A to D deepen number sequence understanding before introducing the main operations of addition, subtraction, multiplication and division. Each operation is introduced with smaller numbers and single digits at first, increasing to larger numbers and double digits and so on. The methodology is also gradually advanced, from horizontal to vertical addition and subtraction, as well as multiplication and division, through small steps and half-worked questions to help children progress. In levels E and F students get to grips with fractions, enabling them to complete addition, subtraction, multiplication and division of fractions through examples and introductory problems. As their confidence and speed grows they move on to more complex problems, learning the correct order of steps to work out the solution, finding the Least Common Denominators and Least Common Multiples, working up to three fractions and four operations. Learners will also start to become more familiar with decimals. Levels G to I aim to help students master positive and negative numbers using the four operations, as well as algebraic expressions and equations. Students are encouraged to write out the steps that they make to get to the solution until they are familiar with the process. Algebraic complexity increases, completing operations with monomials and then polynomials before moving on to factorisation, square roots, quadratic equations and functions and Pythagorean Theorem. Students build the skills to solve problems accurately, writing down appropriate intermediate steps. Levels J to M fully develop students’ algebraic skills before moving on to tackle the basic properties of functions. Students gradually increase their understanding of functions by tackling problems of greater complexity, before moving on to logarithms, limits, differentiation and integration. Students then develop the skills to work with trigonometric functions and equations of straight lines and circles. Levels N and O build the skills needed for advanced integration and differential equations after improving their understanding on limits. Skills that children have built up throughout the maths programme culminate at this point in their ability to complete high school mathematical problems based on their calculation skills developed so far and a sense for graphs. They will also have developed the necessary skills to progress further through self-learning as they will be used to using examples, hints and solution books to understand and execute complex mathematical concepts. Kumon students complete daily Kumon study at home and attend their study centre twice a week. The time taken to complete a day’s work may be around 30 minutes per subject, although this study time can vary. When visiting the study centre, students complete their day’s worksheets and are observed and guided by the Instructor and a team of Assistants. Time spent at the study centre allows the Instructor to support your child in their studies and ensure that they are progressing well. Whilst at the study centre, students hand in work that has been completed and marked at home, as well as collecting work for the following days until their next study centre visit. We have noticed a difference in Amber because of Kumon. We have gone from a situation of her being nervous and dreading maths at school, to being happy and confident and from being slightly behind to being top set at school. I was scared of maths and numbers before I started Kumon and now I am really confident and can always keep up with my school work. Amber was really scared of numbers when she first enrolled with Kumon but we have all worked together to build her confidence and ability through the right study programme for her.